The doctor uses his hands to properly realign the shoulder, the elbow, the wrists, the hips, the knees and the ankles. They also have specialized techniques to realign the jaw to help with nighttime grinding issues, problems chewing or generalized TMJ pain. Jaw: TMJ disorders are a common problem of the jaw. A common solution offered is getting a nighttime bite splint. While this may reduce the inflammation in the joint by creating a cushion for grinding, it often times will not stop the grinding problem itself. 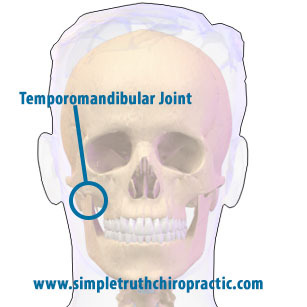 The TMJ stands for the temporomandibular joint and is where your jaw connects to your skull. Many people have problems grinding, chewing, or pain within the jaw joints. There are many people where they just feel like their teeth aren't lining up right. While this can come from a structural issue that a dentist may need to examine, often times this can be the result of the jaw not being in the proper alignment. A skilled chiropractor can help restore function to the jaw through a specific TMJ correction, thus reducing pain, grinding, stiffness, clicking and locked jaw issues. pain, numbness, tingling, weakness, tendinitis or inflammation. There are 3 joints we typically look at within the shoulder. The first is the glenohumeral joint, which is the ball and socket joint of the shoulder. Often times if there is dysfunction with this joint, this creates weakness, especially with the bench press. If you notice you can't push up well with one side of your body during the bench press, then having a skilled chiropractor examine your glenohumeral joint is a good idea. The second joint is the A/C (acromioclavicular joint). A/C joint pain can typically described as pain on the top of the shoulder where your clavicle (collar bone) meets your shoulder and is very inflamed. Dysfunction of the A/C joint often leads to difficulty doing lateral raises and flies. 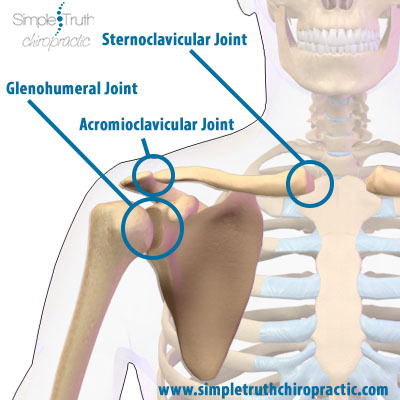 The last joint that we look at in the shoulder is the S/C (sternoclavicular) joint. S/C joint pain usually causes pain to shoot down the shoulder and into the elbow along the outside edge. Dysfunction in this joint can make it difficult to do push-ups. radius. Each of these bones can get out of alignment with repetitive motions like typing, lifting, twisting or with a fall onto the elbow. There are many different elbow problems like tennis elbow (lateral epicondylitis) and golfers elbow (medial epicodylitis) that can result from a dysfunctional elbow joint. The radius is the bone that goes from the outside part of your elbow to your thumb and problems with the radius can create pain at the radial head, difficulty grasping with the thumb, and wrist issues at the base of the thumb. 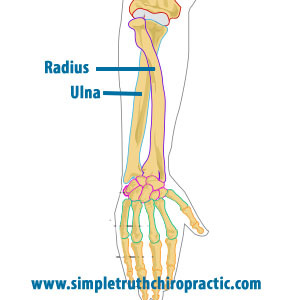 Problems with the ulna can create carpal tunnel like symptoms (numbness and tingling in the hand), pain on the outside of your wrist near the pinky and pain directly on the point of the elbow where it may be painful to rest it on a table or a chair. surgery for the wrist where they fuse bones or cut the carpal ligament. Often times, the symptoms continue to persist after the surgeries and sometimes get worse. This is because the pathway of the median nerve starts in the neck, travels through the shoulder, elbow and into the wrist. There are many different reasons why you could be getting numbness and tingling into the hand, which is why we specifically check each and every muscle and joint from the neck to the wrist to determine if there is a problem at any point along the nerve. We have helped hundreds of people avoid surgery through specific exercises and specific chiropractic adjustments to the spine and arm. Many people also suffer from finger and hand pain that can be caused by repetitive motions creating rotation of the finger joints. 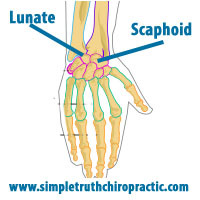 There are actually 8 bones that make up the wrist joint, but the most common bones to cause issues are the scaphoid and the lunate bones. If you feel a popping or cracking in the wrists, it's usually because one of these bones is out of position and is creating inflammation and swelling within the joint. While many health problems can be traced to the spine, other joints of the body can be involved. 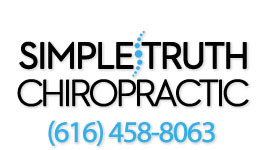 When chiropractic techniques are applied, range of motion can be improved and painful inflammation reduced. Without drugs or surgery! If you have a child in sports or if you are looking to improve your athletic performance or recovery from an injury, call our office today at 616-458-8063.